Musician, songwriter, producer, actor, director, activist, radio DJ and one of the founding members of Bruce Springsteen’s iconic E Street Band, Steven Van Zandt, is bringing his rousing “Soulfire” tour to Adelaide for one headline show this April! 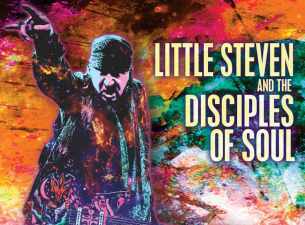 Each show takes fans on an epic and electrifying journey through Rock and Roll history led by one of its most passionate practitioners, Little Steven. As well as co-producing two of Springsteen’s most beloved albums, Born In The U.S.A and The River, Little Steven has countless other accolades to his name including helping create the “Jersey Shore” sound with the Asbury Jukes, a starring role in two award-winning TV shows The Sopranos and Lilyhammer and as host of the acclaimed weekly international radio show Little Steven’s Underground Garage. This will be an evening of pure Rock and Soul chemistry that will be sure to thrill audiences – don’t miss your chance to witness this master-class in iconic Rock n Roll!